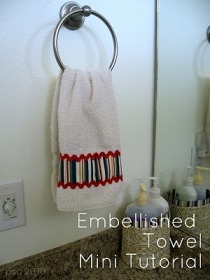 Chris from Pickup Some Creativity shares a tutorial showing how to embellish a towel. Use fabric that coordinates with your decor to add a quick designer touch to your bathroom or kitchen. Get the how-to. Thank you for featuring my tutorial! I’m tickled.